The Japanese Government has been working with farmers in Gilgit-Baltistan to introduce marketing techniques for their produce. The result has been a reduction in waste and an increase in income for farmers. If farmers can establish a strong brand, they have the potential to make Gilgit-Baltistan a hub for organic fruit, strengthening the region’s identity and wealth. 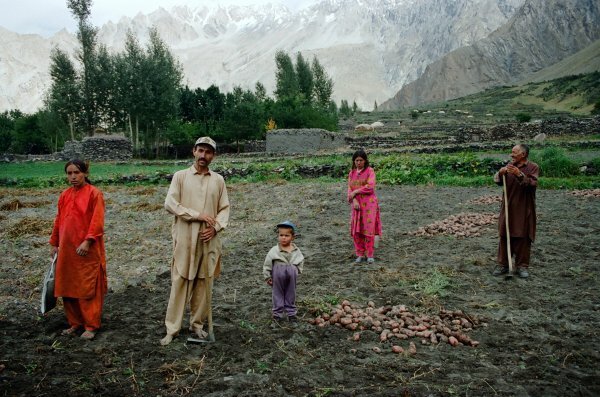 With assistance of the Japanese government, the farmers' incomes in Gilgit-Baltistan (GB) have increased, as they were trained to make value addition to their hard produce. The GB fruit growers were given proper training of their organic fruit products through good packaging and better marketing techniques. The Japanese government provided technical and financial support, which helped increase farmers' incomes. The Japan International Cooperation Agency (JICA) has been working on a four-year pilot project for "Promotion of Value Added Fruit Products in Gilgit-Baltistan (GB)" in Pakistan since August 2012 in the target areas of Baltistan and Hunza-Nagar, the areas where around half of their products always went wasted before the project being implemented, said JICA Senior Programme Officer Amir Bukhari in a press briefing arranged by the Japanese Embassy on Monday. He said after introduction of marketing techniques, value addition, packaging and branding, the farmers' products are now getting good price without any waste. "Earlier, not only their production was low, but also yielded low price for their produce. Now, they are getting much better price and their incomes have increased several folds," Bukhari said. Gilgit-Baltistan has per capita income of around $600, almost half of the entire Pakistan. The organic fruits including apples, apricots, walnuts, grapes, dates, plums, cherry, peaches, blue berries, water and honey melon are grown in GB. However, most fruits are wasted due to difficult access to market, inefficiency in cultivation, processing technologies and marketing activities. Almost 50% of the whole crop income of a household in this area comes from fruit trees. Under the project, several community-based organizations were established and their members along with officials of the GB Agriculture Department were trained in Pakistan, Japan and Turkey. "This Rs 465 million project, in which the government's share of Rs 28.53 million, is funding value addition of apples and apricots. Interestingly, people in these areas don't appreciate the usage of fertilisers, pesticides and other technology and prefer to use traditional farming. Under the project, without disturbing the nature, the JICA is only introducing them to the better production, marketing, and value addition and packaging techniques," Bukhari said. GB Agriculture Department Extension Expert Dr Fazalur Rehman, who recently came back from Japan after getting training, said, "GB is the hub of apricots, there are around 65 types of apricots but due to unavailability of good marketing, packaging and value addition facilities, almost 50% are wasted." He said that unless the private sector doesn't come forward, the agriculture sector cannot get growth and developed.